In order to avoid the troubles of constant roof repairs, it is always important that the roof is installed right and accorded better maintenance. Roof coating is one of the most efficient and cost-effective options for enhancing the appeal and lifespan of the roofing. But, successful roof coating can only be achieved if the procedure is done by an expert, using the right products. In case the procedure is poorly conducted, you could be faced with greater problems that might even force you to replace the whole roof. Waterproofing Singapore are the professionals that can provide lasting roof coating solutions for all types of roofs. Having been doing roof coating for many years, we know the most suitable techniques and materials that can give your roof the best protection against common forms of damage. Our company offers roof coating services for homes as well as commercial property across Singapore, with a guarantee of the most fulfilling results. We always pursue unique roof coating approaches for custom solutions. Proper roof coating offers a strong protective layer over the roofing waterproofing materials so that they are able to withstand damage from the Ultra Violet and sun rays. The coating forms a shell over the roofing materials, which can effectively deflect hat from the surfaces. As a result of this, the roof is able to last for quite a long time without maintenance. High quality roof coating can significantly lower the temperatures on the surface of roofing materials. This ensures that the in-built environment remains cool even when the sun is blazing outside. With this, you will not have to use a lot of energy in cooling, which could impact lower electricity bills. Roof coating can also go a long way in maintaining the aesthetics of the roof since the materials used in the procedure are resistant to fading. This will not only keep your roof but, the whole building looking good for a longer period of time. Roof coating can be done on a wide range of roofing materials including, asphalt roofs, metal roofing, wooden roofs, galvanized metal roofs, composite roofs among several others. Despite the particular materials that your roof is made of, we can always provide the best roof coating to keep it appealing and stronger for longer. Considering all the benefits of roof coating above, it is one of the best roof maintenance procedures that you should never ignore. And, we have just the right solutions to all your roof coating needs. Our company has a dedicated team of roofing experts with many years’ experience on the job to always provide custom roof coating treatments for both residential and commercial buildings in Singapore. Whether you are constructing a new house or renovating an existing one, we can always offer the best roof coating services for a long lasting roof. At Waterproofing Singapore, we are always very keen on every step that we take when it comes to roof coating. For tailor made solutions, we always begin all our procedures with a thorough inspection of the site or roof to be coated. This is usually important in making sure that the surfaces are properly prepared before the coating is applied. For new roofs, we will make sure that the surfaces are properly cleaned so the coat is able to properly bond with the surfaces. However, we can still conduct other necessary preparations for the best results. In case the coating is to be applied on a roof that was erected some years back, we will first carefully check for any signs of damage before the treatment is done. 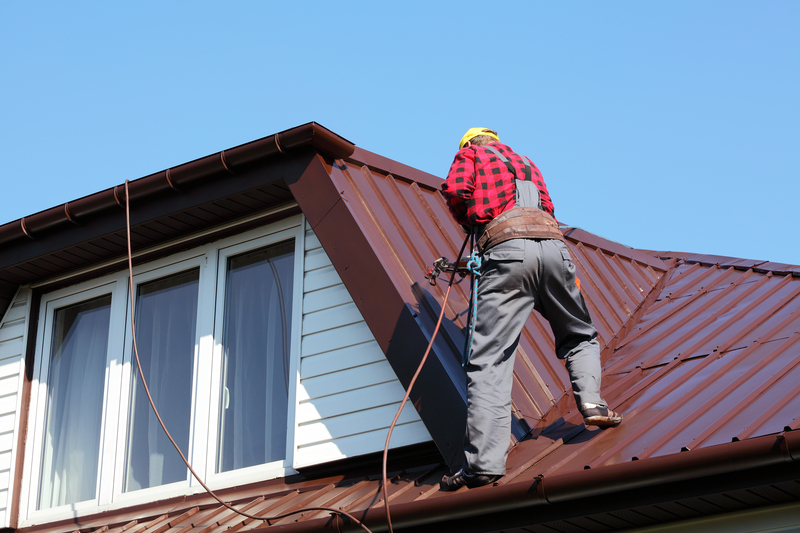 Our company also offers roof repair services and, can help with making sure that all kinds of damage are effectively fixed before the coating is applied. Our specialists will properly fix all roof leaks, ceiling leaks, flashing issues, shingles and other forms of roof damage prior to coating. In case roof coating is done without fixing all these underlying problems, the coating cannot be effective. There are various kinds of roof coating products that we use in performing the procedures including, asphalt emulsions, acrylic roof coatings, solvent-based asphalt coatings, solvent-based silicone coatings among others. Depending on the type of roof that you have, its condition and your needs, we will select and apply the most suitable products for a smooth and lasting finish. Although sometimes clients come with their minds already made up on the particular coatings to be used, our experts can always advise on an appropriate solution, which is safe and cost-effective. At Waterproofing Singapore, we always strive to provide the best roof coating services at the convenience of every client. Our company has adequate personnel and tools for the job, which enables us to always serve clients with greater reliability. We can handle both small, medium and larger roof coating projects within the given deadlines. Since we serve homes and commercial enterprises, there is no doubt you will always get the ultimate roof coating solutions whenever and wherever you need in Singapore. Despite the quality workmanship that we provide, our company has the most competitive prices in the industry. We do our billing based on the specific budgetary expectations of every client to enable you save more. Even if you are operating on a limited budget, we can still make sure that you are accorded top notch roof coating services. For regular clients, we also have other amazing offers for greater savings. And, we continuously review of prices in order to make it more affordable for various people to acquire professional roof coating services in Singapore. Besides roof coating, we also provide other roof services, roof waterproofing and roof waterproofing membrane, which you can also acquire to keep your roofing in the best condition. Simply contact us for a free roof coating estimate.